Orange County Dance Center’s pre-professional ballet company, Ballet Repertory Theatre (BRT), presents its 42nd annual production of The Nutcracker Ballet. Performed in its original, full-length version, this delightful holiday classic has become the longest-running production of its kind in Orange County. To learn more, click on our 2018 Nutcracker fact sheet. For photos, videos, and more, “like” BRT’s Facebook page at https://www.facebook.com/balletrepertorytheatre or follow “balletrephb” on Instagram and Twitter. The Ballet Repertory Theatre Association (BRTA) is a non-profit, all-volunteer organization (federal tax ID no. 33-0873296) that raises the funds needed to support all 3 of BRT’s annual productions, especially The Nutcracker Ballet. BRTA members are available to answer all Nutcracker-related questions at [email protected]. This year’s BRTA Open House is scheduled for Sunday, September 30 from 10:00 am to 1:00 pm, and Friday, October 5 from 5:30 pm to 6:30 pm outside OCDC. To help Ballet Repertory Theatre, please scroll down to the Fundraising and Volunteering sections. Your generosity alone allows the Nutcracker to happen. Thank you! All performances are held at the Golden West College Mainstage Theater. Tickets can be purchased online at: www.gwctheater.com. Tickets are on sale as of October 1st. Phone purchases: Call the theater box office at 714-895-8150 x1 and leave a message. A theater staff member will return your call. In-person purchases: Box office hours vary. Please call 714-895-8150 to verify box office hours on the day you wish to visit. Tickets will also be available for sale at the theater box office one hour before each show time. It is best, however, to purchase tickets in advance, online, as many performances sell out. Please use the forms below to help Ballet Repertory Theatre’s 42nd Nutcracker and future productions. If you have any questions about the forms below or about BRTA, please email [email protected]. Completed forms should be dropped off in the BRTA box at the Orange County Dance Center front desk. 2018 Nutcracker welcome letter to OCDC families – See all of the form deadlines listed together. This letter is distributed to parents during presentations at the studio. 2018 Nutcracker Souvenir Program Ad Order Form – Parents – due Sunday, November 11. Celebrate your child’s participation in the Nutcracker by placing a personal message. 2018 Nutcracker Souvenir Program Ad Order Form – Businesses – due Sunday, November 11. Advertise for your business to an estimated audience of 5,ooo patrons. 2018 Nutcracker Raffle Donations Form – Parents – due Sunday, November 11. Receive a donation receipt for your taxes by donating to the raffle held at the theater December 24th. 2018 Nutcracker Raffle Donations Form – Businesses – due Sunday, November 11. Receive a donation receipt for your taxes and advertise for your business by donating to the raffle. 2018-19 Season Membership Form – due Sunday, November 11. Receive a donation receipt for your taxes by becoming a supporting member of the BRT. You can also donate to the “role basket” that will be raffled off at the theater during the last show (one each for Baby Mice, Angels, Soldiers, Party Scene, Ponchinellas/Entertainers, Company) . There will be a specially labeled box in the OCDC lobby to collect your monetary donations; any amount helps. BRTA volunteers will collect donations regularly and create a themed basket representing each role with the money raised. If you cannot contribute financially, you can go to smile.amazon.com, enter “Ballet Repertory Theatre Assoc” as your preferred charity in the search box, and shop as you normally would. There will be no difference in your shopping experience and this can be done with all Amazon accounts, including Prime. 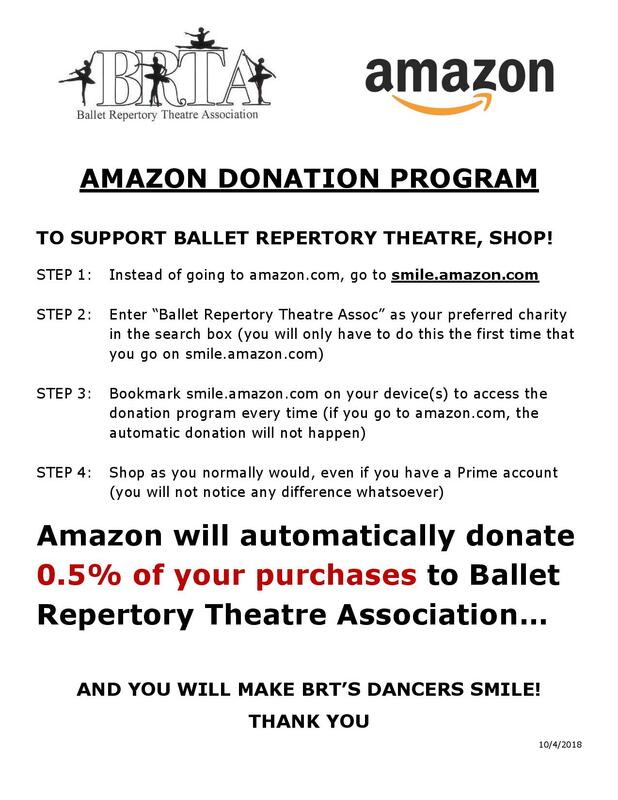 Amazon will donate 0.5% of your purchases directly to Ballet Repertory Theatre Association. Please remember to go to smile.amazon.com every time you shop for the donation to happen; you will not have to re-enter your choice of our association. Parent sign-up sheets will be available on a table near the OCDC front entrance during dress rehearsal days for parents to volunteer to supervise children backstage and help with costumes. Parents are asked to sign up at least once during the Nutcracker season. This sign-up is organized by Ballet Repertory Theatre’s Terri Sellars. 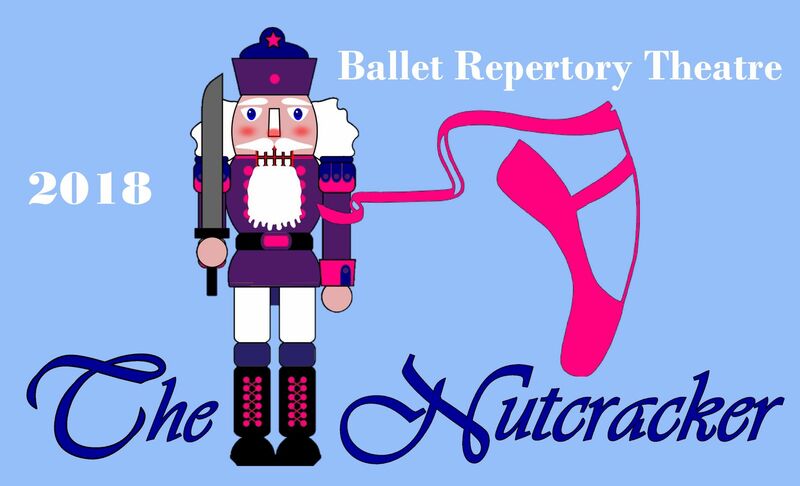 Emails from BRTA’s signup.com account will be sent to the parents of each group of performers as the start of Nutcracker shows approaches. These emails will show all the time slots for which parents can sign up to help at the theater as boutique sellers, raffle ticket sellers, refreshments servers, or theater ushers. These are all easy tasks for which BRTA members will offer quick training at the theater. Donations of baked goods, water, and juice will also appear as an item for which parents can volunteer. This sign-up is organized by BRTA members. High school and college students are also encouraged to volunteer and will receive certificates for their service hours. Please write to [email protected] for more information. Ballet Repertory Theatre’s Nutcracker includes nearly 250 performers in multiple casts. Check back often for more information as it becomes available. Roles are assigned by audition only. There is a $75.00 performance fee per dancer (maximum $150.00 per immediate family), except for “Baby Mice” ($25.00). Please make checks payable to Ballet Repertory Theatre (BRT), due at the first rehearsal. There will be 2 or 3 casts for each role. Performances will be scheduled in consecutive order. Cast requests must be turned in to the front desk before the first rehearsal with a reason. The BRT directors will make every effort to accommodate cast requests. Dress rehearsals: There will be two (2) dress rehearsals at OCDC. Performers will be assigned a date and time based on their cast. A 2- to 3-hour slot will be assigned on these days, based on the performer’s role: Saturday, December 1st between 1:00 pm and 6:00 pm or Sunday, December 2nd between 11:00 am and 5:00 pm. Stage rehearsal: There will be one (1) stage rehearsal at Golden West College Theater. It will take place on Friday, December 7th between 3:00 pm and 9:00 pm. A 2- to 3-hour slot will be assigned based on the performer’s role. The following performer information sheets were handed out to performers at their first rehearsal. They contain specific information, for each role, about casts, schedules, required clothes and shoes, and other important rehearsal and performance notes. Please refer to these handouts often and mark your calendar with all important dates and times.